Very carefully cut the squash in half lengthwise with a very sharp knife. Remove seeds, which leaves a convenient little indentation. Place halves in a baking dish and brush the tops with melted butter. I also poured a bit into the scooped out part. Mix together a dash of cinnamon, pepper, salt, and nutmeg. Sprinkle this over the top. Sprinkle brown sugar liberally over the top, and put a few tablespoonfuls in each indentation. Cover and bake at 350 for about 40 minutes. 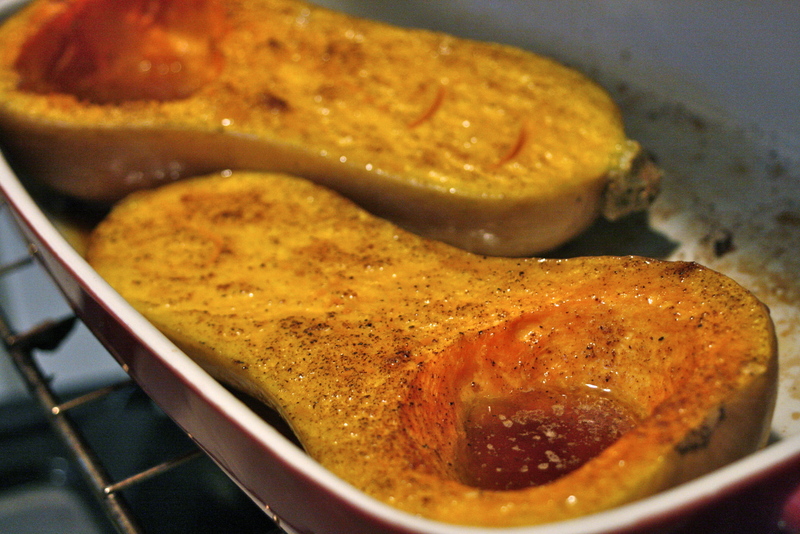 Uncover, and continue baking 20-30 minutes, or until the squash reaches your desired state of tenderness. I found that the melted butter and sugar mixture was the tastiest part of the dish. You can scoop out spoonfuls of the flesh and dip it into the pool of yummy goodness. Or, you can scoop out out all the flesh into a separate dish and mix in the melted sugar concoction, mashed potatoes and gravy style. For more flavor, add just a bit more nutmeg or cinnamon to the finished product. Next time, I plan to cube the squash before I cook it, or perhaps scoop out the flesh about half way through the baking process. I think this might subtract some baking time, as well as allowing more surface area to crisp up a bit. Yum!